Ever since I stumbled upon this gem of a blog (hint: Taylor Tomasi Hill overload!) I can't stop myself from trying to recreate some of her signature looks. (I have this photo to thank for the outfit above.) Of course, my accessory supply is quite dismal in comparison to hers but I recently received this crisp white and rose gold watch from Breil that helped breathe some much needed life into my arm candy collection. And since we're long overdue for a style challenge around these parts, check out how my dear friends Meghan and Rebecca styled their Breil watches. Who knows, if you like what you see, you might even be able to win our watches! Interested? I know you are! Be sure to tune in on Monday for more details. Until then, happy weekend everyone! Great outfit!! I really like the sweater and the pumps!! Love this look, and Taylor Tomasi Hill has the best style! Wow, that sweater is amazing, and you've styled it flawlessly! And thanks for the TTH-overload tumblr - crazy good inspiration! ps Taylor is my all time favorite, best dressed women in the world. I adore her. Wow, the print on the sweater is awesome, it looks so modern. 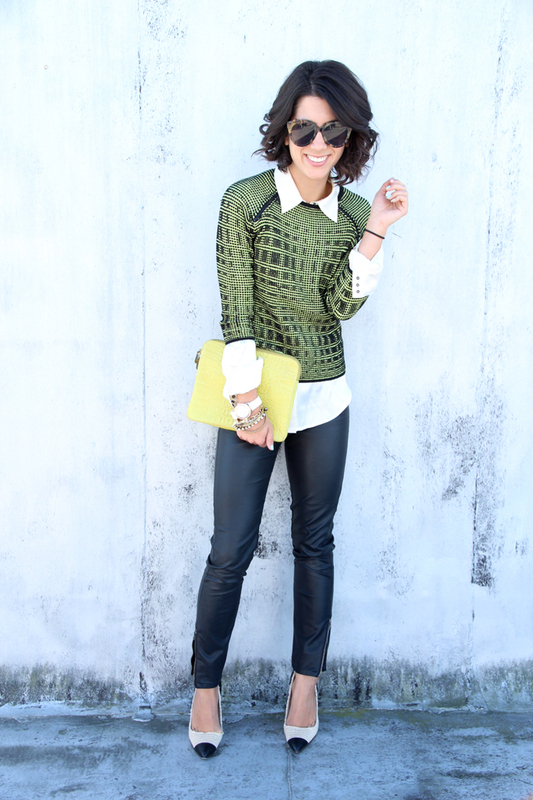 love this look, that print on your sweater is amazing! 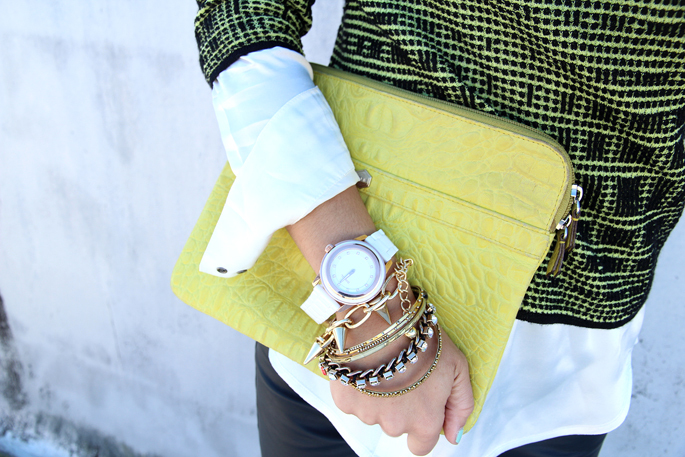 love the arm candy combo today! You're very good at accessorizing your outfits! Love the watch! Looks great with your bracelets. Beautiful job. that sweater is so great! and i dig the watch. a ton. Love your blog. Congrats! Like your bracelet. I really need some pants like that. Especially love the ankle zip. Love the whole outfit, especially the shoes, who compliment nicely the watch! you look gorgeous, as always ! Shoes are amazing and I love Isabel Marant collection! I desperately want a pair of leather skinnies. Love yours! Ahh Love this whole look! I love watches with large faces. Oh it's a very great style and i love your sweater! I love your shirt!! great outfit!!!! Love your wrist stack with the watch and bracelets! Cute outfit. White watches are lovely in spring/summer. I love everything you're wearing, so sophisticated! I love your hair tie on your wrist - are you left handed? I love wearing many many bracelets but I can only do it on my left arm because I'm right handed and all that bulk and commotion gets to me. Love the not so new short hair too. I absolutely love this outfit. That topshop top is great. LOVE this! That sweater is so great, has so much texture. So interested! Also I dig that sweaterrrrr. I'm so distracted by how much I love your sweater!